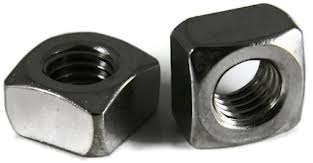 Square Nuts are four-sided, internally threaded fasteners with a flat bottom side and a chamfered, washer-crowned top. They are specifically designed to be used with square head bolts. Currently in our Online Store, square nuts are available in grade 2 RoHS compliant zinc CR+3, plain and hot dipped galvanized.